SEGA has finally released all the high-resolution shots of the limited edition of Blade Arcus from Shining EX, which is a 2D arcade fighting game that is coming to the Playstation 4 and Playstation 3 in Japan this November. 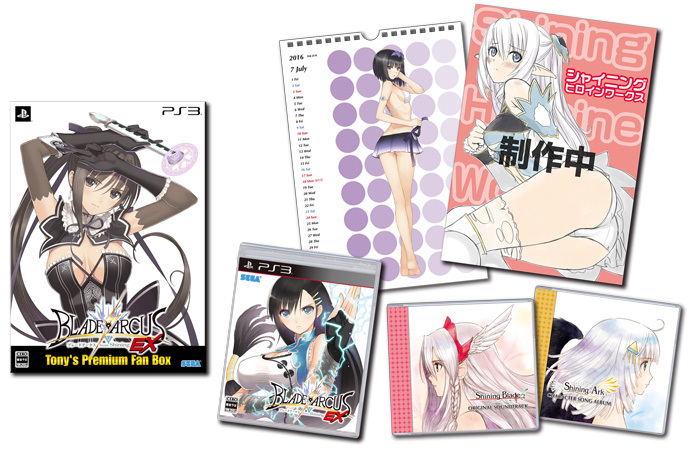 The game’s limited edition is known as the “Tony Taka’s Premium Fan Box“, who is Tony Taka? He is the artist for the newer Shining series of games, specially famous for making anime girls, that well… aren’t exactly fully clothed (see the art in the image header for examples of such work). The game hits Japanese store shelves on Novemeber 26th, all first print copies come with Sonia from Shining Resonance as a playable character. No western release date has been announced, but if you want this edition of the game you can always pre-order it at Play-Asia for $110 USD. For more info, check out the game’s official website.